Red Zinfandel is one of the perennial delights of California viticulture. Its characteristic spice and blueberry-raspberry fruit profile make it a pleasurable sipping wine as well as a natural accompaniment to anything grilled in the back yard. The California producers of Zinfandel – never confuse the high-octane red with the pinkish, cooler-like stuff known as white Zinfandel – are many and scattered, and their styles are wide ranging, as exemplified by two in hand from the 2012 vintage: Cline Family Cellars’ Contra Costa County Big Break Vineyard Zinfandel and Seghesio Family Vineyards’ Sonoma County Old Vine Zinfandel. I do not invoke the phrase high-octane lightly. Both of these wines present the high-alcohol factor typical of Zins, around 15 percent. Hence, savory meat dishes – think blackened treatments as well as barbecue– would be excellent pairings here. Seghesio’s 2012 Old Vine Zinfandel ($34) is just that, sourced from plantings that go back 70 years on average, from vineyards on the Dry Creek bench and Alexander Valley. The result is a Zin of extraordinary finesse, complexity and smoothness. If color is the first thing one notices in a wine, it isn’t always the first factor to make a big impression. But the vivid blue-violet of Seghesio’s Old Vine Zinfandel catches the imagination as well as the eye. It’s magically inviting. Similarly, delicate aromas of blueberry and red raspberry set up the palate for a something quite fine, and that expectation is met. This is a silky example of Zinfandel, mouth filling and medium-long on the finish. The flavor mix is dominated by black cherry and raisin, with a touch of pepper. This is wine for present pleasure, though the wine-maker says Seghesio’s Old Vine Zin could evolve in the cellar for five to seven years. 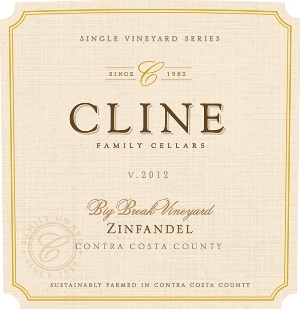 Cline ranks among California’s most ambitious and successful producers not only of Zinfandel but also of Rhône varietals. The Big Break Vineyard from which this Zinfandel comes, is located in Zin-rich Contra Costa County, a sub appellation of California’s Central Coast located due east of San Francisco. The Big Break Vineyard 2012 ($30), one of several single-vineyard Zins from Cline, possesses a grandeur rooted in earthiness. The wine is strikingly dark purple, its nose a blend of dark cherry, anise and mint. On the palate, Cline’s Big Break Zin bears out the nose with an emphasis on the cherry that becomes something closer to cherry-chocolate. It is complex, viscous and well structured with generous ripe tannins and a pronounced acid frame. The winemaker says the Big Break 2012 will thrive through six years of cellaring, but that sounds conservative to me. This is one imposing expression of Zinfandel.